Which of these beaten-up auto stocks is the bear-market gem? Bear-market bargain hunters have been turning over rocks in the auto sector. Automakers' stocks have been under pressure for months, on concerns about slumping earnings as new-car sales soften in key markets around the world. Whenever an industry falls out of favor, there are usually genuine bargains to be found. 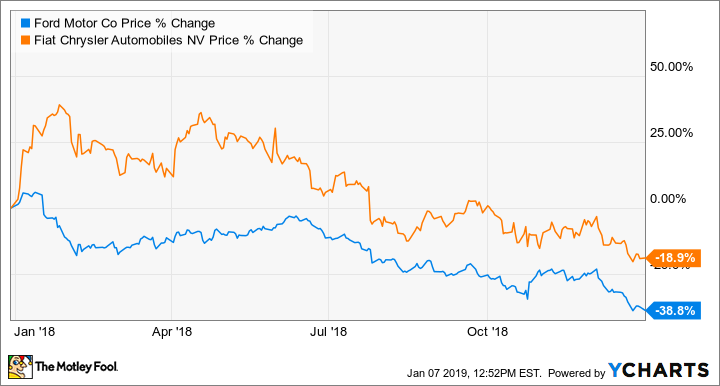 Both Ford Motor Company (NYSE:F) and Fiat Chrysler Automobiles (NYSE:FCAU) have drawn interest from bargain-hunting investors recently -- here's a look at how they stack up as investments for new money now. Ford's profit story starts with its F-Series pickups. Sales are still strong, but other parts of the Ford portfolio have slipped. Image source: Ford Motor Company. Both Ford and FCA saw their shares slip sharply in 2018. But while FCA was down about 19%, Ford's stock price fell much further, almost 39%. When we look at valuation measures based on earnings, we see that both FCA and Ford are trading well below 10 times earnings, the historical norm for auto stocks in good economic times. Ford is trading at about 5.3 times its earnings over the last four quarters, while FCA is trading at roughly 6.6 times its trailing-12-month GAAP earnings, or 4.6 times its adjusted earnings. Looking ahead, Wall Street analysts surveyed by Thomson Reuters expect Ford's 2019 earnings to come in at $1.30 per share, on average. That's down from the $1.55 per share the Blue Oval has earned over the last four quarters, and it gives us a forward price-to-earnings ratio of about 6.4. However, they expect FCA's adjusted earnings to rise in 2019, to 3.27 euros per share, on average, from 2.87 euros per share over the last four quarters, giving us a forward price-to-adjusted-earnings ratio of just over 4. Advantage: FCA. An all-new version of the iconic (and big-selling) Jeep Wrangler arrived as a 2018 model. A brand-new pickup-truck variant is in the works to give sales a further boost. Image source: Fiat Chrysler Automobiles. Ford currently pays a quarterly dividend of $0.15, or $0.60 per year. In the last three years, it has also paid a special "supplemental" dividend early in the year as a way to return some additional profit to shareholders. Ford paid a supplemental dividend of $0.13 in early 2018 for a total dividend payout of $0.73 over the last four quarters. At current prices, that gives us a very high dividend yield of 8.8%. But take note: Ford paid those supplemental dividends in what were exceptionally profitable years. We should not assume that Ford will pay a supplemental dividend this year (or in any year going forward). Ford has said repeatedly that it will strive to maintain its regular dividend ($0.15 per quarter) "through the cycle," meaning through the next recession, and it has the cash flow and reserves in place to do so. That regular dividend translates to a dividend yield of about 7.2% -- still quite high, but realistic. (Note that there are very good reasons to think that Ford will be able to maintain that dividend, even though the current yield looks quite high. As for FCA, it doesn't currently pay a dividend. Advantage: Ford. Right now, Ford is facing a major sales slump in China, eroding pricing power in a sluggish European market, and fading sales of dated sedan and SUV models in the United States. Those are all factors in Ford's slumped stock price. But as I argued recently at greater length here, a big turnaround is likely: All three of those problems can be cured, or at least helped quite a bit, by new products -- and Ford has a slew of them on the way, including all-new versions of the super-important Explorer and Escape crossover SUVs set to arrive this year. Looking further out, CEO Jim Hackett has Ford on a cost-cutting course, working to reduce new-product development times, simplify manufacturing, and move Ford's vehicles to new architectures that share more parts and engineering under the skin. All of that should add up to significant margin improvements, though we probably won't start to see a lot of improvement until 2020. The Ford Territory is a new low-cost crossover SUV for the Chinese market, one of a slew of new products that Ford will bring to China over the next few years. Image source: Ford Motor Company. While Ford is at a tough point in its product-renewal cycle, FCA is at a pretty good one. The mainstay Ram 1500 pickup was all new in early 2018, Jeep's Compass and Wrangler were all new in 2017, the midsize Jeep Cherokee was recently overhauled, and the big-selling Chrysler Pacifica minivan is only a bit older. FCA was ahead of the curve in cutting sedans. It has already eliminated two low-profit sedan models and shuffled its regional production in order to make more high-profit products. While rival General Motors is gearing up to idle several North American factories because of declining sedan sales, FCA won't have to do anything like that: Its factories are quite busy making big-selling (and highly profitable) trucks and SUVs, and there are more new products on the way. In other words, FCA has already done much of the hard work, and it will soon begin to reap the benefits. During FCA's annual capital markets presentation in June, CFO Richard Palmer said that he expects the company's adjusted earnings per share to roughly double over the next four years, thanks to the recent product-line overhaul and the new products that are on the way. Advantage: Both Ford and FCA have credible plans to boost profit and margins. FCA's is ahead of Ford's and likely to yield gains sooner, but both should generate good incremental growth -- assuming the global economies cooperate. FCA axed its mainstream sedans, but it chose to keep the brawny Dodge Charger around. Why? It's still very profitable thanks to popular high-performance trims. Image source: Fiat Chrysler Automobiles. I like Ford, here. While FCA has managed, after years of effort, to reduce its debt load to less than its cash reserve, it still has a lot of debt relative to cash, and I think that could lead to some sleepless nights if the next recession is a deep one. Ford has a much deeper reserve. It also has that dividend, which offers some upside if the economy turns sour and automakers' profits (and share prices) get trimmed. If you can afford to be patient, I think you could do a lot worse than to buy Ford, reinvest that dividend, and wait for Hackett's efforts to push Ford's stock price higher in a few years. It won't be the smoothest ride, but you could be very pleased with the results in time.